Passed away peacefully on Thursday, October 11, 2018 at Groves Memorial Hospital in his 85th year. Devoted husband of 59 years to Bernice Brandon (Weber). Loving father of Rob Brandon (Vesna) and Barb Jordan (Brent). Predeceased by his sisters Colleen Drier and Phyllis Hewitt and niece Cheryl-Anne Hewitt. Survived by sisters Ruth MacDonald, Patricia MacDonald and brother Allan Brandon. Special uncle of Wanda Brown and Elaine Hewitt. He will also be sadly missed by many family and friends. Friends will be received at the Gilbert MacIntyre and Son Funeral Home, Hart Chapel, 1099 Gordon St., Guelph on Tuesday, October 16, 2018 from 1:30 p.m. followed by a service of remembrance at 2:30 p.m. Memorial donations to Trinity United Church or Groves Memorial Hospital would be appreciated. Cards are available at the funeral home 519-821-5077 and condolences can be left at www.gilbertmacintyreandson.com. A special thanks to Dr. Stickney and the 2nd floor nursing staff of Groves Memorial Hospital for their care and compassion. We lived at the Twin Towers in Guelph with Bob and Bernice. What a lovely couple. Bob always ready with a joke. Our sincerest condolences to the entire Brandon family. Our sympathy is extended to Bernice and family on learning of Bob's death. May the assurance of God's love shown through friends and family support you and carry you forward in your time of loss. I worked at the Guelph Animal Hospital in the late '70s and Bob was the local "dog catcher". He regularly brought dogs to us and was a part of the team there. I remember his jovial personality, friendly manner and his skill with the dogs. I was very sorry to hear of his passing. My condolences to his family and friends. My heart goes out to Bernice , Rob and Vesna Barb and Brent at this very difficult time. 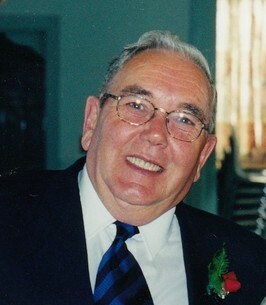 Bob was a loving kind and jolly neighbour and friend. He's going to be missed greatly. He will be remembered each and every day by all who knew and loved him .